Chris Cain, one of the Bay Area's greatest treasures, recently played a show here in Vegas and blew the doors off the joint. Cain is as nuanced a player as you'll ever meet. 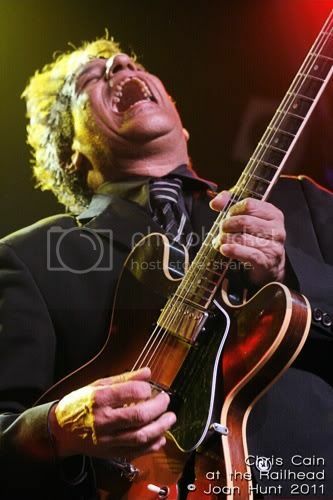 There's so much power in each note, he makes shredders look like fools. There are no limits to what Cain can do with a guitar. He plays it all, from hard rockin' to slow burnin' blues, jazz, you name it. He's as sly as can be, making your heart break one minute, and then callin' you out with your boogie shoes the next. Taking the stage with Cain were Steve Evans on bass, Mike Emerson on keyboards, and Mick Mestek on drums. The two hour show was over far too quickly for the crowd's liking and even the encore seemed to speed right on by. "Steppin' On A High Wire"
Another artist I enjoy a great deal, Mike Zito, will be hitting town July 21. Like Cain, Zito plays it all. Anyone looking for blues in Vegas, Boulder Station Casino's Railhead is where it's at. Anyone interested in a "Dirty Blonde"? Other standout blues performances include Coco Montoya, Tinsley Ellis, and Curtis Salgado. We'll start with my favorite Montoya song. You may recognize that bass player from Chris Cain's band. I got a "Strong Suspicion" you'll like this. Hell, the man could sing the ABCs and enchant a crowd. Rockin' us on home, "The Axe Is Gonna Fall". One of my top three favorite Ellis tunes. For those who are convinced there's nothing more to Vegas than glittering lights and techno pop, here's proof the good stuff won't be found on the Strip. And while the smaller clubs offering blues seem to falling victim to the economy, the Railhead always delivers.